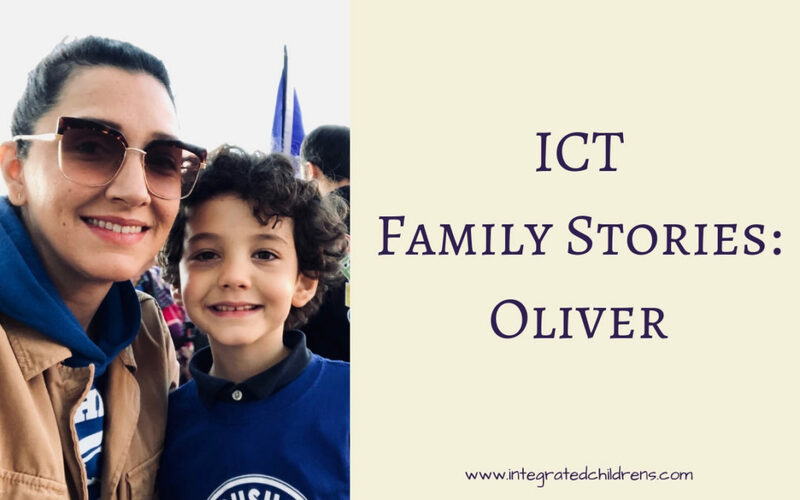 For this ICT Family Story we sat down with Karina O. to talk about her son, Oliver, who receives speech-language therapy from us and is a regular at our camps. When Oliver was diagnosed with autism and sensory processing disorder (SPD), he was three years old and still drinking from a baby bottle. “He found it nearly impossible to drink from anything else,” Karina says. His pediatrician thought he would eventually grow out of it. But Karina was pregnant with her second child, which underscored that Oliver just wasn’t a baby anymore. Karina decided to take matters into her own hands, and sought help. She didn’t suspect the autism and SPD diagnoses, although now she can easily spot red flags in her memories of his baby and toddler years. Signs of autism included low muscle tone that made it difficult for him to crawl and walk, being verbal but struggling to put words and sentences together, and making repetitive movements while playing. It was because of SPD (which makes it difficult to process information coming in through the senses) that he had such a hard time giving up the bottle. It was at ICT that Oliver began countless therapy sessions: Speech-language therapy to help him communicate and relate to others, occupational therapy to help him perform daily tasks and regulate his feelings and behavior, and feeding therapy to teach him to drink from a cup and straw. In addition to ICT’s services, he received physical therapy as well. Today, Karina says, Oliver is “doing incredibly well.” He is 7, attending school, and a walking encyclopedia on dinosaurs — thanks to endlessly studying them through books and documentaries. When asked what advice she would give parents just learning of a child’s diagnosis of a developmental disorder, Karina draws on her experience with ICT: “When you’re new to the therapy world there are so many options and you don’t know what to expect, but it’s important to find the right help. When we found ICT they were not only knowledgeable and professional, but also warm and genuine — just very human. Their play-based approach helped us feel relaxed, and they included us in everything.” Mandy has been a “huge advocate” for Oliver, she adds, helping facilitate a school placement when other schools turned them away.